Upholstery is one of the things that make your house look beautiful, Top Steamer professional technicians are trained to clean every type of fabric and upholstery, we use specially formulated cleaning solutions for your upholstery type. We use our powerful 3 step deep clean process to clean your upholstery. Our professional trained technicians take the time to understand everything your upholstery may need. We spray a special heated solution to the upholstery fabric to loosen all soil, oils and embedded dirt. Next we used a thorough fiber rinse extraction to removed all dirt and cleaning solution from your sofa or chair. We clean micro fiber, velvet, velour, synthetic, canvas all types of cleanable upholstered furniture. Commercial office chairs and cubicle panel dividers as well. Our professional technicians are highly trained to clean any type of fabric even the most difficult ones choosing the right cleaning solution for your upholstery type. Step 1: We pre-spray your upholstery with a special formulated upholstery cleaning solution to loosen soil, stains, body oil and embedded dirt. Step 2: We use a special upholstery brushed to agitate soiled areas and to help the cleaning agent performed better loosening the dirt and stains. Step 3: We use a hot water extraction method with a specially formulated ph balanced fiber rinse to extract all dirt and chemical residue from your precious upholstery leaving a soft and clean looking upholstery. Let us restore that brand new look to your upholstery with our professional 3 step upholstery cleaning process, give us a call today to set up your appointment 305-631-5757. A professional cleaning performed on a regular three seat sofa can take approximately 45 minutes to an hour. There are companies out there advertising low prices for furniture cleaning, those companies wont even take 30 minutes to professionally clean your upholstery. Be cautious when hiring an upholstery cleaning company ask for a written estimate before job is performed. We recommend our customers to protect their upholstery with our special upholstery protectors to prolong cleanliness of upholstery and to prevent spills from staining the upholstery. If you have any questions about upholstery cleaning please refer to our FAQ section and click on upholstery cleaning. Watch the upholstery cleaning video below and see how our 3 step deep upholstery cleaning process removes all dirt, leaving a much cleaner upholstery and returning it to its original condition. Top Steamer highly recommends after having your upholstery clean to protect your upholstery with our specially formulated upholstery protectors to prevent spills from staining your precious upholstery and to repel soil and body oils. We also recommend for customer with pets our powerful high quality deodorizers to remove any stubborn pet odors that may have penetrated your upholstery. We specialized in office upholstery cleaning. We used our hot water extraction method (steam cleaning) with a powerful cleaning solution follow by a ph balanced fiber rinse to leave upholstery clean and residue free. We also specialize in cubicle cleaning. Office chairs and cubicles must be clean periodically to prevent allergies from dust mites and to improve your office indoor air quality. Call us now for a FREE estimate today 305-631-5757. Pets Laying on Your Couches? 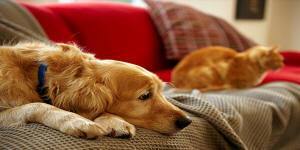 Do you have pet odor on your upholstery? We can help with our deep cleaning and our special formulated odor control solutions we can make your upholstery smell clean and fresh again. Some pets like to lay on top of the cushions or rub against the upholstery making a darker area from there skin and sometimes even urine gets in your upholstery from pet accidents. Is always good to call as soon as possible to eliminate and remove the urine from the cushions before it dries and the odor becomes more noticeable. We use a specially formulated urine odor and stain removal to treat the affected areas in your upholstery when cleaning is performed, sometimes will require more than one cleaning to remove all urine residue and odor from upholstery. impresionante foto de antes y después de un sofá que limpiamos en Hialeah. Desde que fueron comprados hace mas de diez años nunca se habían limpiado. Puede ver en la foto la diferencia del antes y el después del sofá. Ofrecemos servicio de limpieza de muebles en Miami Beach contamos con mas de 15 años de experiencia en limpieza de muebles. Brindamos nuestro servicio de limpieza de muebles, sillas, butacas en lugares residenciales y comerciales. Llame para hacer una cita 305-631-5757 o para una cotización gratis y sin compromisos. Somos una compañía seria y honesta. Limpieza de sofá y tapetes en Key Biscayne servicio profesional y detallado por compañía local con mas de 15 años de experiencia. Utilizamos los equipos, productos mas especializados y adecuados para la limpieza de muebles y tapetes existentes en la industria, lo cual nos permite brindar una limpieza profunda de sus muebles removiendo suciedad, polvo, ácaros, pelo, manchas. Professional sofa cleaning services in Coral Gables by your local sofa cleaning company Top Steamer℠ let us refresh your living room sofas with our deep sofa cleaning system. Our powerful three step sofa cleaning removes all dust, sweat, contaminants, odors and stains from your sofas leaving them feeling super clean and looking like new again. My chairs were really dirty and I called Top Steamer and they did a great job, very happy! Top Steamer did an excellent job with our couch! They were early and efficient and the couch looks brand new!. I highly recommend them for any upholstery cleaning! Efficient and easy to work with! We arranged the appointment electronically via yelp and they confirmed such with an email. They arrived on time and immediately began working. They cleaned a couch and chair. Both are very clean and smell new. I highly recommend them.